Good food, good health, good fun! Celebrate Christmas morning (or any special occasion) with these warmly spiced gingerbread pancakes topped with gooey caramelized apples. To make caramelized apples, melt butter over medium-high heat in a 10-inch, non-stick skillet. Add apples slices. Cook and stir until apples begin to soften, about 4 minutes. Sprinkle brown sugar and cinnamon over apples. Mix well and cook for 2 more minutes. Whisk together apple juice and cornstarch until lump free. Add to apples in skillet. Cook until sauce thickens and apples reach desired degree of tenderness. Don’t let them get mushy! Keep warm until ready to serve. To make pancakes, preheat griddle to medium-high heat. Combine both flours, brown sugar, cinnamon, ginger, baking powder, baking soda, salt, nutmeg and cloves in a large bowl. Set aside. In a medium bowl, whisk together buttermilk, egg, molasses, butter and vanilla. Add wet ingredients to dry ingredients and mix just until dry ingredients are moistened. Spray griddle lightly with cooking spray. Spoon batter by ½-cupfuls onto hot griddle and spread to make 5-inch circles. Cook until undersides are lightly browned. Flip pancakes and cook until other sides are lightly browned, about 2 more minutes. 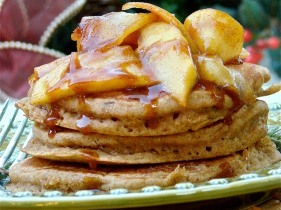 Serve pancakes topped with warm caramelized apples. Creamy buttermilk is a key ingredient in these luscious, fluffy pancakes. However, in a pinch, here’s our favorite buttermilk substitution: a 50-50 blend of plain, natural yogurt and milk! For this recipe, you’d whisk together 3/4 cup yogurt plus 3/4 cup milk (skim, 1%, 2%…you decide) until well-blended. We’ve found this to be a highly superior buttermilk substitution compared to the ol’ “add-a-tablespoon-of-vinegar-to-a-cup-of-milk-and-let-it-sit-for-a-few-minutes” method. Follow us on Twitter and check us out on Facebook for nutrition tips, recipe ideas, breaking J&G news, behind-the-scenes photos, lively discussions and friendly gossip. We're always dreaming up new recipes for our TV show, for magazines and for our family and friends who constantly badger us for more. Want in on the action? Sign up here and we'll send you new recipes as we create them, hot off the garlic press!